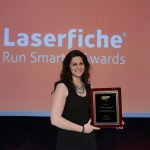 Laserfiche has announced the winners of its annual Run Smarter® Awards program, including seven commercial organizations from Africa, Australasia, Europe, the Middle East and North America. ArcelorMittal S.A., the largest steel producer on the African continent, streamlines HR operations by scanning and processing employee records ten times faster with Laserfiche. MOVE Logistics, one of New Zealand’s most successful warehousing and transport organizations, uses Laserfiche to improve information accuracy and streamline purchase order approvals. Sun Hung Kai Real Estate, a major properties developer in Hong Kong, uses Laserfiche to share documents across departments. Since implementation, the firm has saved an estimated 85% on document filing and storage, as well as 75% on printing costs. CIRCOR Pibiviesse, a highly engineered valve manufacturer located in Italy, uses Laserfiche to improve customer service by providing 24/7 access to product documentation. Saudi Arabian Airlines, the national airline of Saudi Arabia, uses Laserfiche to expedite financial transaction processing. Mark Anthony Group, one of North America’s most diversified and successful private beverage companies, uses Laserfiche to expedite the accounts payable process. Steinhafels, a regional furniture store with 22 locations across the MidWest, used Laserfiche to digitize and standardize 36 common HR forms and procedures. This saves the company $80,000 a year in manual labor costs for in the HR and accounts payable departments alone. The Run Smarter® awards ceremony took place this morning during the Laserfiche Empower 2015 Conference in Anaheim, CA. For real-time updates, follow #empower15 on Twitter.